Crisis talks to end a dispute crippling Southern services have ended without a deal in place. A 48-hour strike by train drivers’ union ASLEF started on Tuesday, which led rail operator Govia Thameslink Railway to cancel all Southern services. A third day of strike action is planned for tomorrow (Friday), although talks were held between the two sides yesterday and today. But GTR confirmed that talks have ended without an agreement. Nick Brown, chief operating officer of GTR, Southern’s parent, said: “We’re deeply disappointed, as our passengers will be, that ASLEF has been unable to accept our proposals and we have been cannot find a way forward to end this dispute with the drivers’ union at this stage. “We’re sincerely sorry that commuters work and family lives are being punished with this unjustified and unprecetented industrial action. “The unions must stop the pain and suffering blighting passengers and commerce. “We will continue with our plans to modernise our railway and the services we offer customers. 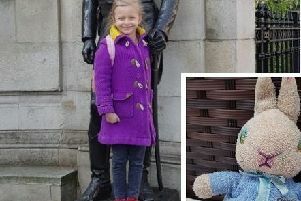 Can you help reunite ‘distraught’ Eastbourne girl with her favourite toy?